I know that when it comes to recipes on the blog, I’m all about the puddings. But did you know, I like dinners too? This is one of my favourite dinners in the entire world. Did I mention that I like dinner, do you like dinner? I like dinners A LOT so to have this one elevated to my top… *thinks*… TEN all time dinners is nothing to be sniffed at! I might even like dinners more than I like makeup. It’s THAT serious people. 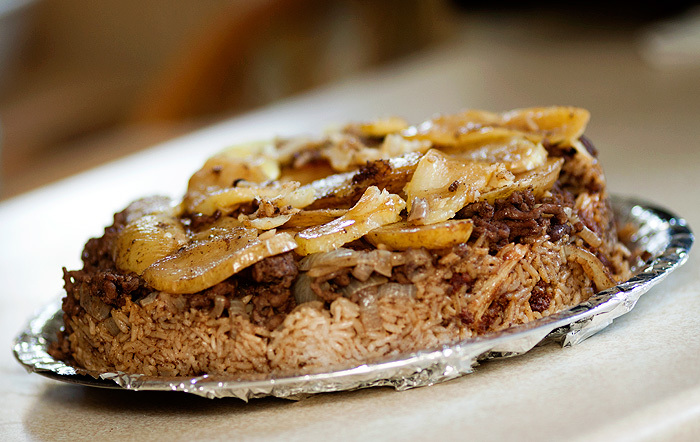 Makloubeh (literally meaning Upside Down) is a family dish cooked in a large pot, originating from the Middle East. My uncle was Jordanian (he passed away in 1996) and the entire family would pile over his house on New Years Day to feast on Makloubeh. Then we’d all go play Boggle or Battleships or something else that makes me feel old whenever I remember it. The traditional recipes online call for eggplant (my uncle never included it). I add potato for no other reason than to protect the meat/rice from catching on the bottom of the pan. Well, that and the fact that my family are potato fiends. This dish is not very healthy. Don’t be fooled by the inclusion of cauliflower. YOU DEEP FRY IT. A quick note about the meat. My uncle always used lamb shoulder, which is expensive in the UK. I use mince (ground beef or lamb) or chicken thigh. We only have lamb in this dish if it’s a special occasion and I apparently never put enough in the pot. My horrible brother has christened my version of Lamb Makloubeh, “McNoMeat”. 1). Salt the cauliflower and fry until dark brown (yes, really). I use a deep fryer. Cover a plate in kitchen towel and allow cooked cauliflower to rest on the plate once cooked. 2). Pat sliced potatoes dry and deep fry until golden, transfer onto more kitchen towel to soak up the excess oil. 3). Brown the meat and onions in a frying pan before adding all the spices and crumbling the stock cube over the mixture. 4). Add about an inch of hot water to the pan, drop in the garlic and allow the meat to gently simmer for around 5 minutes. 5). Take a large pot (something like this), add 2tbsp of oil and layer the potatoes on the bottom of the pan. Spoon the (sloppy) meat and onion mixture over this before adding the cooked cauliflower. 6). Add the uncooked rice and pour over enough hot water to barely cover the rice. 7). Cover with a lid and cook on a medium heat (you want a gentle simmer) until the rice is cooked (20-30 minutes). Don’t stir! 8). Once the rice is cooked, all the water should have been absorbed. If not, simmer for a little longer with the lid off. 9). 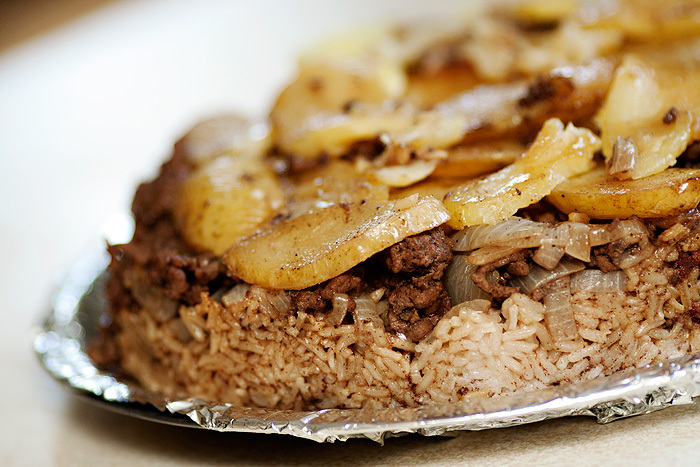 Grab a tray and line it with foil. Tip the pot upside down (hence the name!) onto the tray and sprinkle with pine nuts. 10). Stick it in the middle of the table and let people serve themselves, preferably with lots of natural yoghurt. p.s. If you want to make your version a little healthier (and clearly less fun), you could probably roast the cauliflower and potatoes before adding them to the pot… probably. Do you have any favourite Middle Eastern dishes? I’ll have to try my hand at a (gasp) vegetarian version of this, because it looks ideal for cool-weather cooking! I adore Middle Eastern foods; aside from the luscious sweets, there’s a lentil-stuffed eggplant dish in one of my cookbooks (though I’m forgetting which one) that’s a particular favourite of mine. It’s earthy and velvety and rich and comforting all at once — perfection! Definitely gonna try this for my friday night dinner tomorrow. Looks yummy, making me hungry! One of my friend is from Iran and I’ve eaten at her place few times – with her huge family where not many speak Finnish/English. 😀 It’s been delicious and now that picture makes me hungry. I am going to have to try making this for a weekend dinner. I wonder how it would taste using a sweet italian sausage? This looks absolutely scrumptious! I think the hubby would just love it. My God, that looks delicious! I’ll definitely be trying this one, and I love your step 11 – my kinda recipe! Oh now you have done a savoury dish and a middle eastern one, please please add more. Love this type of meal, thanks weekend food here I come. I couldn’t decide what to make for iftar tonight and remembered this post of yours! I think I’m going to make it with chicken…it sounds and looks divine, thanks for the recipe! The pot to cook in link has gone can you let me know what sort of pot I need to cook it in again?